Not only do I feel that Mother's Day is a day to honor those mothers who have influenced my life for good in so many ways (because they are simply amazing...more on that later), but I feel like it's a day to reflect on how incredibly blessed I feel to be counted among Mothers. Am I treating it as the sacred job that it is to get to be the "one" to care for these children? I'm working on making my eyes shine back and slowing down instead of stressing out about the myriad of "do dos" stretching out endlessly before me. And I'm working on turning everything else "off" when they're home from school. Which is VERY hard, I might add, in our technology driven society! I want to be in the moment as much as I can. That's when I'm happiest. I also want to "give back" to other mothers who have buoyed me up in my motherhood. So..........I'm going host a couple give-aways this week in honor of Mother's Day. Things I think will help other mothers re-evaluate their mothering too. 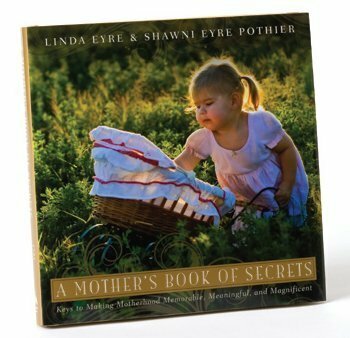 Today the give-away is "A Mother's Book of Secrets." I've never done one of these before, so bear with me! But I want as many people as possible to have this motherhood book in their hands. It has a two-fold purpose, you see. Not only will it help you remember/renew your own Motherhood "secrets," and help you add to your arsenal (I'm a little biased, but I feel like it has the power to jolt mothers into more conscientious mothering), but each copy sold will help fight blindness (we give 100% of the royalties to the Foundation Fighting Blindness and Foundation for Blind Children). And sometimes, like when Lucy looks right past me in the dark like she is a blind person, I just want to stand up and fight harder than ever against that. If you already have one of these puppies, hey, who couldn't use a Motherhood book to give away to a friend? Leave a comment if you want to be in the drawing. I will draw a winner on Friday. Oh wait, you already know about give-aways. p.s. And remember, just in case you don't want to wait for all this mumbo jumbo give-away stuff and you really want to get a book for yourself or someone else special for Mother's Day (there's still time! ), click here. They're 20% off in honor of Lucy. But even if you buy one, still enter the give-away. You can't have too many motherhood books! Please note that this give-away is now closed. Thanks so much for the entries! I so enjoy reading your blog ad can only imagine I would love your book just as much! I would love to add this to my library! What a generous gift for any mother out there. Love you blog and thanks for keeping it real! Wow! I'm in love with all your ideas and have been wanting to get my hands on your book for a long time. I would so love a copy but would be excited for anyone who got such a lovely gift. Thanks for all that you do! WOULD LOVE TO READ YOUR BOOK! PROBABLY NEED IT SINCE MY ATIENCE IS THIN, MY TEMPER IS HOT AND MY MIND IS STARTING TO DRAW BLOANKS!!! I would love to have the book as well. I have lots of good things about it. You are so generous! I love this book, and would give it away to my girlfriend so she could love it too! You are a wonderful mother - keep up the great work, and blog! I could always use another good book in my arsenal. Count me in! I do have one, but what a great gift! I would love to read your book as I have enjoyed reading your blog. wow! what a gift! I would love to have a coopy of your book! It would be a great source of inspiration to this young mother that lives in a foreign land without her mother! :) Thank you! And thank you for sharing your thoughts. It helps more than you think. Gracias. Wonderful quote from Iris Krasnow. I may use that quote for my Quote of the week. I already have one but, my sister is a young new mother and i think this book would be a great inspiration to her!!! Fingers crossed! I would love to read your book! I love your blog! I read my sister's copy but need one of my own for "reference." I've also read several of you parent's books and loved them. Count me in. I would LOVE this...I already learn so much from your blog, can't imagine how much more with your book. Thank you! I feel a little bad entering to win a copy of your book, because really I should BUY it to support the cause, but... here I am. I did drop a hint to my husband, though -- maybe he'll come through for Mother's Day! Your blog is so inspiring and I would love to read the book. thanks for the offer. My good friend referred me to your blog and it is awesome! Makes me want to be a better mother and helps me stay focused on what is important....love the turning off everything when the kids are home. Working on that one! Thanks and Happy Mother's Day to you! Your blog has been providing me with inspiration for quite some time. Thank you so much! Hey Shawni! Been wanting to take a look. Couldn't believe it when I saw your book in the Deseret Book flier. Wasn't surprised, though. Your a great mom! Would love this book. Thank you!!! I don't even know you personally, yet the way you write about your family and the pictures you take make me yearn to be a better mother to my precious kids. Thank you for the opportunity to have this book!! I love reading your blog, you are always so positive and have great insights. I'm sure the book has lots of them, too! I would love to win one! You are amazing and such a great mother! I'm sad I missed womens conf in Spokane. Next Time!! I would love to have the book, too! I can't think of a better mothers day gift!! I love your blog. You inspire me to be a better mother! I would love one of your books! Your blog is seriously my favorite each day. I am so excited when you pop up in my reader. I would love to get my hands on your book. Happy Mother's day Shawni...you seriously are an inspiring mother in my life. I would love to win you book, thanks for the chance! Happy Mother's Day to you. I love your book and would love to share it with someone. I would love to have a copy of your book! Thanks for the chance to win!! I LOVE, LOVE , LOVE your blog. It helps me become a better mother every time I read it! When i'm having a hard day I just hop onto your blog and I feel completely rejuvenated! I already have your book(which I LOVE too) but I have really wanted to give one to my sister in law who is struggling with being a mom right now. Thanks for your guidance and help in my life. I've recently discovered your blog.... and I love it! I would love an opportunity to win your book! Thanks!!! Happy Mother's Day! I need all the secrets I can get. I LOVE this book...when I got it I read the whole thing in one day! My friend just had her 3rd baby and i gave my copy away to her and she loves it as well! Ive been meaning to buy me another one but thats on my endlist to do list!!! Ill get there haha unless i win! i either need one of these, or need to spend a week with you. You choose! :) thanks, I hope I win! Thanks for all the insightful wisdom! I love your blog, would adore your book (it's on my wish list!) and appreciate your offer! I've heard such amazing things about your book and always feel uplifted and inspired reading your blog. Thanks so much! Shawni, I feel guilty for putting my name in the hat because I should just buy one - but I often have a hard time buying for myself. I would LOVE a copy of this book. I struggle with the same things and today just happens to be an especially "down on myself" day. Thanks for your thoughts and for the chance to win!! This looks like a book that all mothers, including myself, would benefit. I would really love to have this book. I live in St. George, but can't make your special retreat. So, disappointing... the book would make me feel better! i recieved this book last year for mother's day, and after reading it through and then again and again, i have deemed it a must-have for mothers. i have so many friends who i would love to have it! I would love to add this to my library and share it with others. Thanks! I've been wanting that book of yours for months! Would love to just win it! ooo, I love this book and I have a friend that just became a mother and knows she would enjoy this! You truly are an influence for good and your light is being held high for others to see. Carry on! Linda, if you're reading this then "congratulations on raising a wonderful daughter"! but would love a copy. I love your blog. Please pick me! Awesome giveaway! been dying to read this. Thank you for the inspiration on your blog. I am one of your many blog stalkers and I look forward to reading it. I purchased the book awhile back and I am truly IN LOVE with it!!! I would love to win another copy to give to my sister. I'd love to give one to my daughter who is a new mother. Thanks for the offer! Your take on motherhood on your blog is so inspiring. I'd love to have it in book form, too. I gave mine away in RS basket and have yet to buy an new one. I really enjoy the book and would love another copy. I love your lovely book, and would love to give it to my 8 sisters in law! LOVE this book! I'd love an extra copy... for my mom! Ooooh! Pick me, pick me!!! Thank you for doing this, I have been dying to read this book! !Happy Mothers Day! Happy Mother's Day! Thank you for sharing your thoughts and resolve to be a better mother. That is a great way for each of us to celebrate the day! Pick me! (even if its random!) I am blessed to be a mother three times over. Happy Mother's Day! Oh ! I would love this book. I have the book...LOVE it! It has changed the way I view motherhood. I would love to give it to a friend! Wow how I would love a copy of this book!! It is on my "wish list"... Thank you! I love you blog and am dying to read for book! This would be a great mother's day present for myself! I found your mom's website today and almost cried. I feel like I have done so many things wrong in parenting. I NEED THE BOOK. I love your family. Thank you. You guys are a blessing. I really want this book! thanks for the giveaway. This book looks so wonderful! My coffee table is now adourned with a STAR WARS book of pictures.. It needs replacing!!!! Please and thank you. Love all your inspirational stories! I would be thrilled to win! Happy Mother's Day to you. I LOVE your book! I know just who I would give it to. I love your book! Would love to win and pass it along to a friend! I was just thinking of sending you a note to let you know how much I look forward to reading all your posts. As a young mom I feel like I'm learning from your insights and thoughts and I really appreciate it! Each day I feel like I'm gaining a great appreciation for this sacred roll we all share and have been feeling so fulfilled staying at home (I've gone back and forth on going back to work part time). Thank you thank you for all you do. It has to be a sacrifice to blog so much and put yourself out there, but I for one, have really appreciated it! I think my mom is bringing me her copy of your book, but I would love one to give to a good friend. Thanks again, and keep up the amazing work! Oh how I'd love this!! It would be a wonderful gift for my Mum! What a great book idea. I saw your story on Design Mom and was so insipered (being a new mom of 2) . Your children are beautiful. Happy [early] Mothers Day! I recently bought this book and I love it! I would love another one to give to a friend. I would love a copy...thank you! I love reading your blog. You are an inspiration!! Oh who doesn't love a contest and with such an amazing prize, count me in!! I recently learned that doing hard stuff only makes me better. I wish I had learned that a while ago! I got it from your blog! I can't thank you enough! I love your blog and would love to win your book! Shawni, saw you in Spokane. You and your momma were great! I would love this book! You are truly amazing! What a wonderful give-away. Love your blog! Oh I've been wanting to read your book! Thanks for the giveaway! I am enjoying your blog. We were lucky to have your very talented sister take our pictures last fall. You are an inspiration as a Mother and a Woman! (: Thank you for sharing yourself and your words with the world. You help to make the world a better, more beautiful place! I would love one! Your blog is so inspiring. Thank you. Would love to own a copy! I have enjoyed your blog for quite some time now. Love your blog. I love that the procedes go to such a great cause. I would love a copy for myself though! I would love to win a copy of your book, thanks for the offer! I read your blog..I'd love to read your book! I am a silent admirer and have not posted anything before, but your blog is so refreshing and I would love to have the book. You do not know how many lives you have changed for the better. Thank you for being such a great example of a Mother. My friends said it was great! Thanks for the generous offer and Happy Mother's Day to a mother I admire! I'm sure I would love your book, because I am so inspired by your blog. Thanks for the giveaway! Oh I hope you pick me! Makes me happy just thinking I might win! I love your blog Shawni. I met your mom at education week at BYU and have been reading it ever since. I love all of your posts on motherhood and I would love your book of mothering secrets. My husband and I are students so a give away is an amazing offer! Thank you so much! I'd love the chance to win your book, thanks! I so enjoy reading your blog. My mother, sister and sister-in-laws were in Spokane this last weekend to hear you and your mother speak. I have to say I was a little jealous. I would love a motherhood book. Who doesn't need a little pick me up now and then. Thanks for being so generous!! I would LOVE to win this for my sister for her 1st Mother's Day. I absolutely LOVe my book! Happy Mother's Day Shawni! I would love to give this book to my mother. She would love it. I love reading your blog it is so fun. I would LOVE LOVE LOVE to win a copy of your book..You and your mother are so insightful and I appreciate you both sharing your wisdom with women of the world. Wow! You are a really popular woman. Can't wait to see who wins. Happy Mother's Day! I only found your blog a few days ago, but spent the entire day reading it! Just reading about how you view motherhood in everyday life made me want to read your book, and anything would be worth helping your sweet Lucy. I'm going to buy a copy regardless. I think your book will better prepare me to be a mother someday. Thanks for your inspiration! I love all your motherhood "secrets"! Thanks for sharing! Oh I would love it. So sweet, so happy, love it! I love reading what you have to say each week..I would be honored to have your book too! I'm a mother of four very sweet girls & thankful that I get to stay @ home with them everyday. I'd love to be inspired by your book because I know how much your blog has inspired me! Thank you for all you share & the beautiful pictures you post. Happy Mother's Day! I am a total lurker but just have to say how much I adore your blog and how much I admire you! I just basically want to BE you. :) Or at the very least be LIKE you!I already have this book and it is one of my favorites. I always seem to read just the right "chapter" at the right time, it always hits home for me and is what I need to read at that particular moment. Thank you so much. If I win I would give it to my mom or one of my fellow moms in the 'trenches.' :) Wish I could give a copy to all of my friends! I also am devouring many books written by your parents and love them as well. Anyway, long comment! I'll stop typing now. :)Happy Mother's Day! What an awesome giveaway!!! Anything that you and your Mom wrote together has to be amazing!! I came across your blog a few months back and fell in love with it. It is so inspiring that I read it every day after checking my emails! It is so wonderful to have a glimpse into a Christian mother's experience. Thanks for sharing your struggles and your joys, your inspirations and your fears so openly. I would absolutely love to read your book! Wishing you and your family the very best. May God bless you abundantly. Happy Mothers day Shawni, and thank you for the chance to enter a give away. Your blog inspires me, Thank you from Far South Tasmania, Australia. We are expecting our first child this summer. What a wonderful treasure your book would be to our home! What a great mother's day gift! My mom would love it! Is it at Deseret Book? Where can I get it? Thank you for your wisdom and insight on your blog. I read this book from the library and would love to own a copy! I have wanted to pick up a copy of your big since I heard you speak in Ogden at the TOFW conference earlier this year. Can't wait to get a copy even if I don't win :)! Reading your blog has made me a better mom already. Even my husband noticed a difference. WE only have 2 kids, but 450 head of cattle and I work 3 days a week for health insurance. I would love to read your book and see how much more i can learn!!!!! What a great mothers' day gift (for me)! Thanks for the giveaway and the reminders about what is important in life. I would love to read your book! I love your blog, and I will buy a couple of books just because I think that Lucy is just about the most darling little girl in the world! I would love(need) some secrets to motherhood! Thanks! I would love to recieve this book! I want want want your book! thanks for the chance! This has been on my list to purchase but to win it would be even better. Thanks for the opportunity. Shawni-I just gave three of them away this week to my friends with my favorite general conference talk for a mother's day gift. Would love to give one to another friend! I love your book and have been meaning to buy myself a copy. I love your blog! Thanks for the giveaway! I would love to win your book!! I always flip through it at my sisters house. It would be great to have my own copy. I enjoy your blog and I think you have an outstanding family. Thanks for the contest. Happy Mother's Day to you! I would really love to win this...after all, it IS my favorite blog!! I have it on my list if *wants* for Mother's Day...If I don't get it, or win it, I will purchase it for myself. By the way, I love how you *mother*! I'd love to read your book. I can only imagine how much I would enjoy it from reading your blog. Thank you for the generous offer. I don't remember how I found your blog, but I love it! I'm not a mom yet, but would love a copy of your book! :) Happy Mother's Day! I've been wanting to read your book since I first heard about it. I would love to win a copy! Thank you sooo much! Love reading about your love for your children. You can be an inspiration. My mom heard about your book & how wonderful it is that she placed it on hold at our local library. They didn't have it, so they had "A Mother's Book of Secrets" sent all the way from BYU-Hawaii. She loved reading it & I found her crying several times while reading about your little Lucy. My mom does way too much for me & my family and I can't wait to celebrate Mother's Day wit her. She would love it if she could always have on-hand a copy of this outstanding book. Thank you for inspiring motherhood! I read your post on Design Mom and am completely moved. This looks like such a lovely book and it would be a joy to have! You're amazing! I would LOVE it! Thank you. I could really use this book!